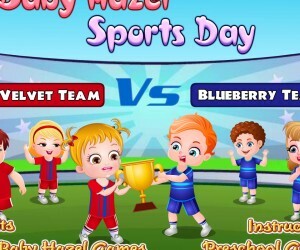 Baby Hazel Stomach Care game is a pretty realistic and accurate role playing game for taking care of a young child that has a stomach problem. The game shows Baby Hazel eating a nutritious breakfast and then sneaking some treats back to her bedroom and gorging on them. She gets a stomach ache and lower tract distress. The mother has to take the child to the doctor for a checkup, shot and medicine. There is a distinct clipboard message from the doctor that instructs the parent and child to eat a healthy diet to keep from having the same problem again. The idea is to help parents pass to their children healthy eating habits and avoiding excessive treats as a way to stay away from the doctor. 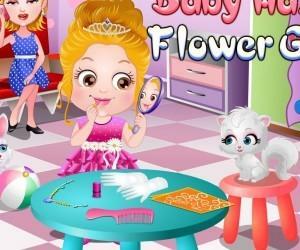 The game can also help a child overcome any fear they may have of doctors and routine wellness checkups. The game is as fast paced as you can make it. 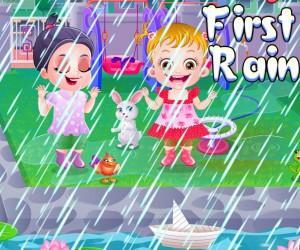 The idea is to produce memory skills and develop eye hand coordination as well as mouse skills in young children and teach them about good eating habits and doctors. The game also teaches good parenting skills. The game is totally mouse driven. The four separate play screens depict the kitchen, Baby Hazel’s bedroom, the doctor’s office, the bedroom after seeing the doctor, and an end page with a well baby and a happy mommy. A hand points to the object that the baby, mother or doctor need. The basic idea is to pick the object up, deliver the object to the right place as directed by the hand pointer, and score as many points (indicated by the baby’s happiness) in the shortest time possible. The activities also include kissing, petting, pampering, and wiping away the tears of a sick child. 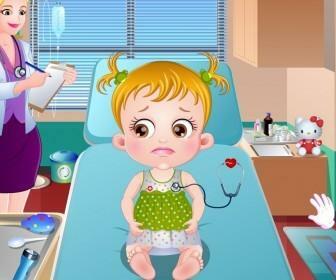 The doctor’s office visit includes most of the activities a real doctor does when a child has a stomach problem. These include use of a stethoscope, taking temperature, medicine and the dreaded shot. Multiple five second visits to the rest room add a knowing touch of humor to the game. Finally, back at home baby hazel eats some food, takes her medicine and gets better. The game is rather simple and funny. The bathroom trips are sure to make kids and adults laugh. The artwork is excellent. You will for sure fall in love with Baby Hazel!! !